We returned from the plantation and made phone contact with Mike. We had been planning to go to Commander's Palace, and he was game for that, even though he hadn't brought a jacket. 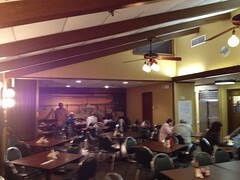 But when we met him at Commander's Palace, he said that they were promising a long delay for a table. That tipped the balance for us, and we suggested Bozo's instead. The host at Bozo's also claimed a wait of over an hour, but when we glanced at the empty tables, he made it clear that he was joking. 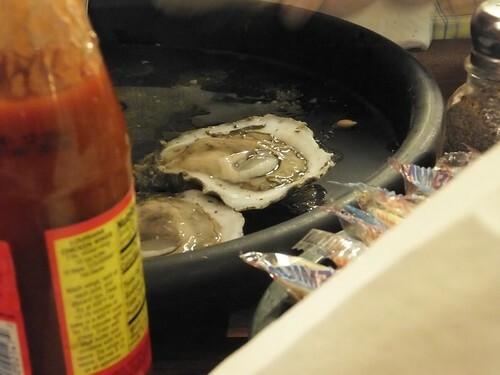 Mike ordered the raw oysters eagerly, and offered to share them with us. Lori is firmly anti-oyster, but I gave them a try. I haven't had raw oysters often (I think this was my fourth time), and I certainly couldn't call myself an oyster enthusiast, but these were really tasty, with a big slurp able flavor. I would gladly eat these again, and since Mike shared very generously, I ate several from the platters he ordered. I saw crawfish on the specials board. 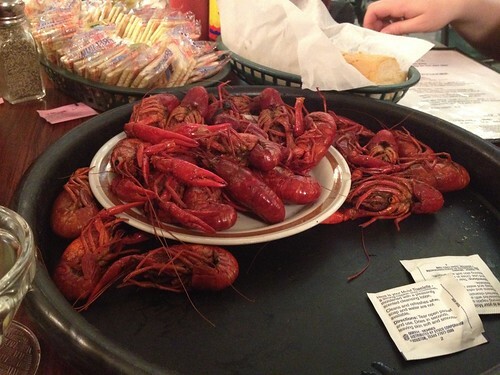 I've only tried crawfish at the 2010 Roadfood festival, and I was not a big fan then. But the price was only five or six bucks, and I figured that would be a small enough portion that I could share that with Mike and Lori as a modest appetizer. I was wrong. I was served a whole mess o' crawfish. But wow, they were tasty; they converted me to loving catfish. Lori frowns upon both crawfish and seafood, so wasn't attracted by either of our appetizers. So we ordered another appetizer, the Mediterranean stuffed artichoke. 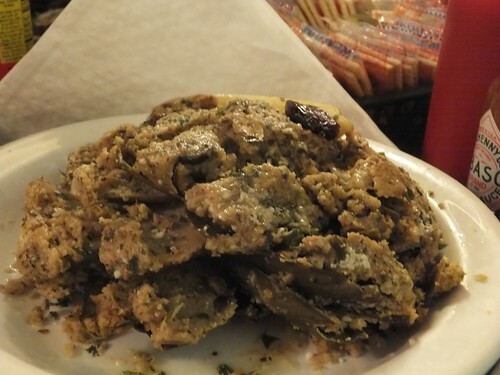 This was a mega-stuffed artichoke, crammed full of bread, feta cheese, and olives. 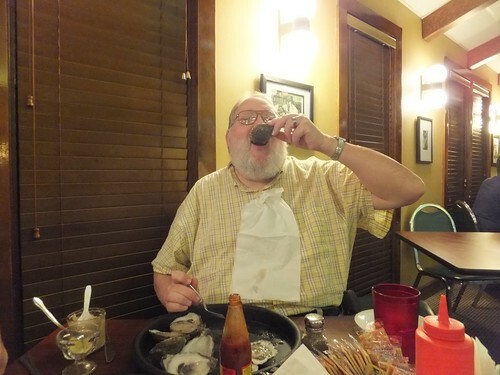 Mike ordered a bowl of gumbo. In all our time with him in New Orleans, I don't think I ever saw him pass up a gumbo opportunity. I would have expected that we would have ordered something, but I have nothing recorded in my notes or photos. I suspect that we were sufficiently full from our appetizers that entrees were superfluous. 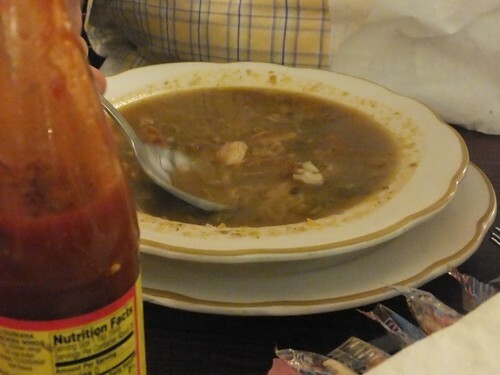 We did get a cup of the shrimp stew, after a conversation with the waitress in which we failed to understand her attempts to explain the difference between the shrimp stew and the gumbo. My belief is that the shrimp stew includes shrimp and the trinity and is served over rice, but differs from a gumbo in that it does not include roux or filé powder. But that's just a guess; to the waitress, the distinction was too obvious to be explained. We did order dessert, because the specials board mentioned a caribbean meringue. This was claimed not to be a pie by the waitress, but it looked like a meringue pie to us—but not a particularly tasty one, unfortunately. The filling was a custard filling with flavors of cherry and pineapple. Apparently I don't have a picture. Despite the imperfect communication with the waitress, we liked her a lot; she was funny and talkative, and we had a good time talking with her.